Yaounde, spread over 7 hills, is the capital city of Cameroon, its in the southern part of the country. Seen on this angle, Yaounde has touristics sights to visit and you will be not disappoint. In the next lines we will give you details regarding Yaounde Touristic Sights you don’t have to miss. 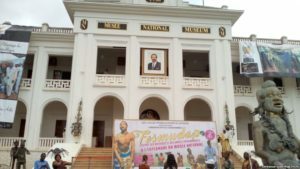 First of all, as Yaounde Touristic Sights we have National Museum The Cameroon National Museum. 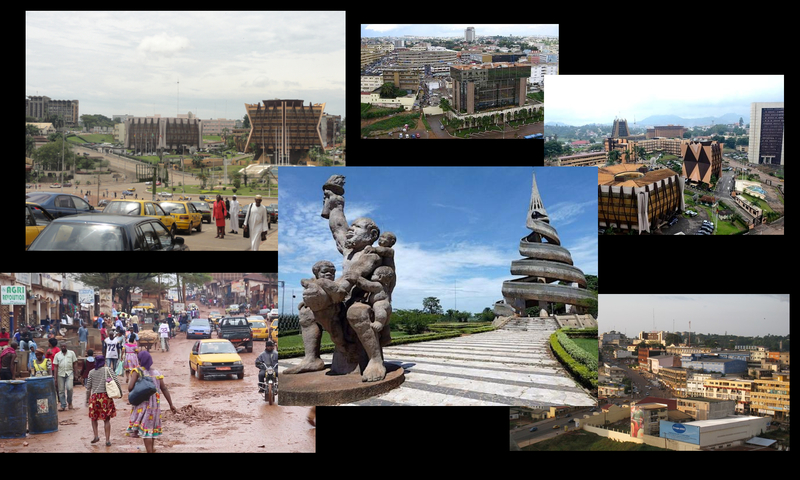 Located in city center its become a major point of attraction for many Cameroonians and visitors from across the globe. The origin of this historic building dates back to 1930 years when colonial masters still in control of the territory. Second we have Blackitude Museum which is an ethnographic museum in Yaounde. The museum project began in March 1998 from a commitment of its founding president. Obviously with the desire to save what remains of Cameroon artistic legacy, this place represents Cameroon in all its diversity. 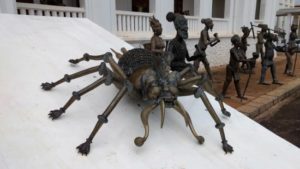 The site owns all Cameroon’s Department collections of art objects which has a signification for each district. Thirdly Benedictine Museum of Mont-Febe, has peculiar items and works of art that portray the nation’s diverse culture. The well-maintained venue has a total of four display rooms, surrounded by trimmed lawns and exotic decorative trees. Once you enter, grab a catalogue to fully immerse yourself in the ethnographic museum’s mission, history, and exhibits. When you walk through the corridors, including unusual bronze and wooden statues, ivory pipes, and tribal masks. You can purchase a copy of the book-catalogue as a souvenir. 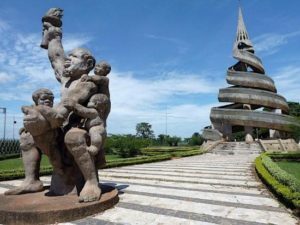 Cameroon’s Reunification Monument construction was in the 1970s to memorialize the post-colonial merging of British and French Cameroon. Base in Yaounde, it was name by Gedeon Mpondo and Engelbert Mveng. This monument is therefore a physical representation of the reunification between French and British Cameroons. Hence a depiction of the hopes and dreams of a bilingual Cameroon. In addition to its historic significance is its enchanting display of architectural impressiveness enhanced by the erstwhile staircase. The banquet hall at the basement and garden making it an ideal location to sit and admire nature. 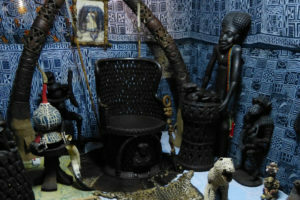 If your are interest by Cameroon’s history and knows independence national heroes, there is Charles Atangana figurine. This statue location is in Yaounde, is a patriotic gentleman who fight for independence of Cameroon. Furthermore you can find a Colonel Leclerc monument, a historical site located in Yaounde city center. On August 27, 1940, Colonel Leclerc becomes the Commander of French Cameroon, appointed by General De Gaulles. Thank you for the advice . I enjoy what you guys tend to be up too. This sort of clever work and exposure! Keep up the great works guys I’ve incorporated you guys to my own blogroll. The next time I learn a weblog, I hope that it doesnt disappoint me as much as this one. I mean, I do know it was my option to read, but I actually thought youd have something attention-grabbing to say. All I hear is a bunch of whining about one thing that you could fix should you werent too busy searching for attention. Thanks so much for providing individuals with remarkably marvellous opportunity to discover important secrets from this web site. It is always very useful and packed with a lot of fun for me and my office colleagues to visit your web site a minimum of thrice in a week to study the fresh secrets you will have. And of course, I am just certainly happy with all the terrific suggestions you serve. Some 1 points in this article are in reality the most effective I’ve ever had. I precisely had to thank you very much all over again. I do not know the things that I would have used without the entire pointers documented by you regarding that area. It had become the fearsome condition in my opinion, but encountering a well-written mode you dealt with the issue forced me to weep for happiness. I’m grateful for this support as well as believe you really know what a powerful job your are undertaking training others through your web blog. I know that you’ve never come across all of us. Thank you a lot for giving everyone an extraordinarily pleasant opportunity to read in detail from this blog. It is always very lovely and as well , full of a good time for me personally and my office fellow workers to visit your website at the very least 3 times in a week to study the newest issues you will have. And definitely, I’m so actually amazed for the astonishing tips you serve. Selected 1 facts on this page are undoubtedly the most suitable I have ever had.